LCMS Mercy Medical Teams need volunteers to bring Christ’s mercy and love to the most vulnerable people around the globe. If you have a heart for service, we can provide you with an opportunity. LCMS short-term volunteers have the opportunity to tell people around the world about God’s love for all people through His Son, Jesus Christ. If you want to serve, we can help. LCMS Disaster Response offers informative bulletin inserts to highlight how LCMS members and congregations can faithfully respond to disaster (i.e., tornado, hurricane, earthquake, flood, fire). Whether you have a day, a week or longer, volunteer opportunities are available with the LCMS Texas District as it continues long-term rebuilding efforts following Hurricane Harvey. All skill levels are welcome. “WITNESS” will be the much-anticipated fourth LCMS U biennial national conference. 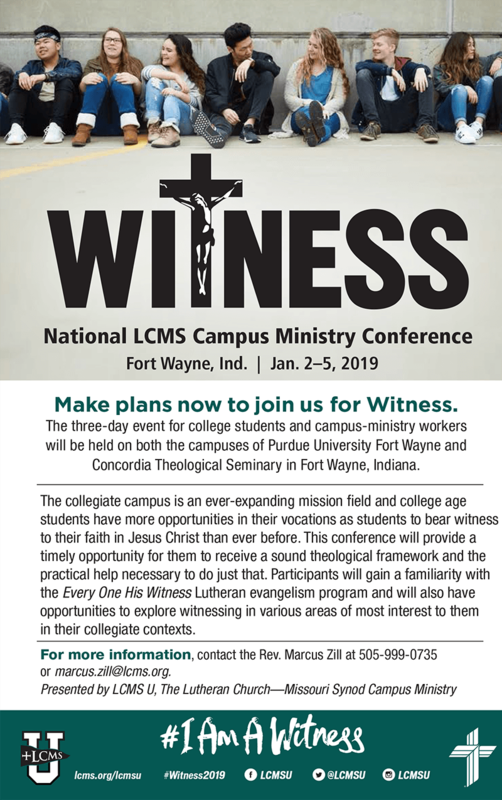 Please help us by promoting WITNESS with your college youth and young adults so that they are aware of this wonderful opportunity! The LCMS Mission Project Catalog, created in response to requests from LCMS members like you, shares essential information about specific national and international mission projects open to receiving special gifts and offerings. Is a series of bulletin inserts featuring seasons of the church year — Advent, Christmas, Epiphany, Lent, Easter and Pentecost. The series also features the liturgy, sanctuary and general information about the Divine Service. Information about popular human care projects to use as bulletin inserts or flyers. Bulletin inserts designed to help your congregation celebrate life.